China is a main producer of the chemicals which go into pharmaceutical fentanyl, and officials are finding it hard to stop production overseas. At the 2019 State of the Union, President Donald Trump once again called to erect a wall on the southern border, in part to address the flow of deadly drugs like fentanyl into the United States. However, experts are skeptical of how much a wall would really do. A wall may help keep some drugs out of the U.S., but it can't stop the problem at its overseas source. According to U.S. law enforcement, most fentanyl found in the U.S. is produced in China. Factories there make a majority of the chemicals used in legal versions of fentanyl for surgery or cancer treatment. But China's chemical industry is huge. Officials can't keep up with what all of its 160,000 companies are up to. From China, the drugs enter the US through one of three pipelines. According to the Government Accountability Office, a small amount of highly potent fentanyl comes directly from China through carriers like UPS or FedEx. Other shipments will go to Canada so it can be trafficked across the U.S.' northern border. A lot of the fentanyl is sent to Mexico, where well-organized drug traffickers cut it with other drugs or press it into pills before they move it across the border. Mexican security officials have had a difficult time tracking the drug as it comes into the country. It's also difficult to say whether a wall would help stop the flow across the southern border — as most drug seizures do not happen around border walls — but rather at legal crossings. A New York Times investigation found at least 80% of fentanyl, methamphetamine, cocaine and heroin seized at U.S. borders came from a vehicle trying to enter the country like any other. Experts say one way to stop the flow could be at its source in China. At last year's G20 summit, Chinese officials promised to re-classify fentanyl as a controlled substance and strengthen the penalties for producers. But nailing down suppliers could be difficult, considering how much of the production happens at legal facilities. 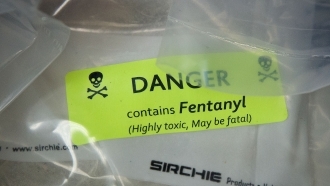 Fentanyl can also be quickly altered to create similar — and unregulated — drugs.